Black German Shepherds are quite rare compared to the Black and Tan saddle GSDs you see around the place and in photos. Their striking visual appearance has led some people to believe this dog is a breed of it’s own. But, is this the case? 1) So, What Are Black German Shepherd Dogs and Puppies? Let’s get one thing cleared up – the Black German Shepherd is not it’s own breed. The Black German Shepherd is officially recognised by the American Kennel Club as one of the colors available for the German Shepherd breed of dog. Other related coat color variations include black and cream, black and red, black and silver, and of course black and tan. When it comes to Black GSDs, their color is caused by their parents and their genes/DNA material. There are 5 main pattern types in the GSD that produce different markings across the body of the GSD. These pattern types include the saddle back pattern, blanket back pattern, bi color pattern, solid pattern and sable pattern. However, even the solid black pattern type GSD have flacks/small areas of white or tan hairs on their body in most instances – mainly between the toes, near the rectal area or around their tail. Black German Shepherd dogs and puppies solid pattern type is also as a result of genes passed down from their parents. The way it works is that a solid black German Shepherd’s parents will have both colour genes and pattern genes. The colour genes passed to the puppy give it it’s available colours, and the pattern genes determine where the colours appear on the body. Black German Shepherd puppies will be born when there are two black GSD parents, OR, when the genes passed down to the puppy (both colour and pattern) are double recessive solid black genes. In the second situation, you can have parents of different colors that aren’t both pure or all black. 2) Are Black German Shepherds Different to Other German Shepherds In Temperament or Health Wise? The best way to answer might be that the black color of the German Shepherd dog or puppy most likely does not make it different to any other color of German Shepherd. Some sources will tell you that black GSDs have their own distinct personalities, temperaments and traits (as a result of their colour), but this may be inaccurate. Differences in personality, temperament or traits is more likely influenced by the lineage or type of GSD (show type or working type background). The Daily Shep wrote about these types in ‘The Ultimate Guide To German Shepherd Dogs and Puppies‘. 3) How Rare are Black German Shepherds? It is hard to get an estimate on how many Black GSDs currently exist. However, what can be said is that while all black, solid black and pure black German Shepherds are more rare than the traditional black and tan bi-color GSDs we are used to seeing, they are more common than other variations like the liver, blue or white GSDs. “Globally, 6.8% of German Shepherds are all-black (and a total of 88% are at least partly black). In North America, 7.7% are all-black, and in Europe 3.4%. But in Australia and in Asia next to none are all-black! 4) Where Can I Find Black German Shepherd Dogs and Puppies For Sale and Adoption? It depends on your country, but you are most likely to find black GSDs in the German/European working lines rather than West German show lines. You may also find black GSDs in the American show lines or pet lines. 5) How Much Are Black German Shepherd Puppies? It really depends on if you buy or adopt, and the breeder or shelter/rescue centre. There is no reason why you should pay any more for a Black GSD than the traditional black and tan GSD. Unethical breeders may tell you they want you to pay more because they are rare and special, but this is simply a way of pushing the price up. On average, you might pay anywhere from $500 to $1500 for a pet, or family dog type German Shepherd from a breeder. For German Shepherds with pedigrees, papers, working titles, specific lines, and puppies who have a proven regulated breeding history – you can pay thousands of dollars. Don’t get ripped off or buy from shady or unethical breeders – read this guide carefully. When adopting a German Shepherd, you might pay anywhere from $50 to $500 – which covers adoption fees. 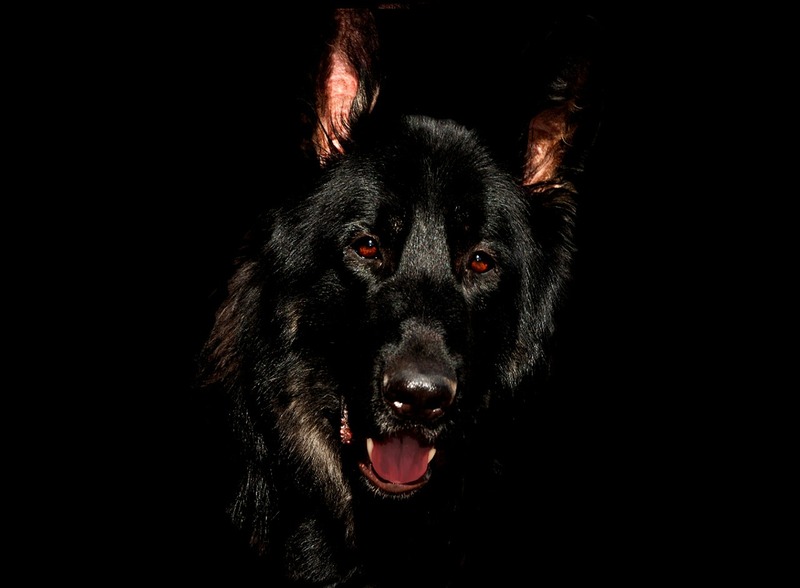 We found a cool Facebook page community for you called ‘Black German Shepherds‘. We are not connected with this page in any way, but they do have lots of photos of Black German Shepherd Dogs.